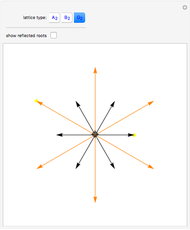 A root system in is a finite collection of spanning vectors (roots) closed under reflection with respect to planes perpendicular to roots. 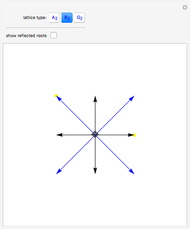 Any hyperplane in divides roots in two sets—positive and negative roots. There are only three irreducible root systems in , labeled , and . Roots of different length are colored differently. 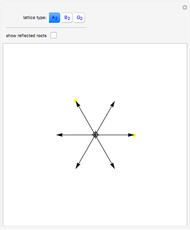 Drag the locator to choose the reflection plane. 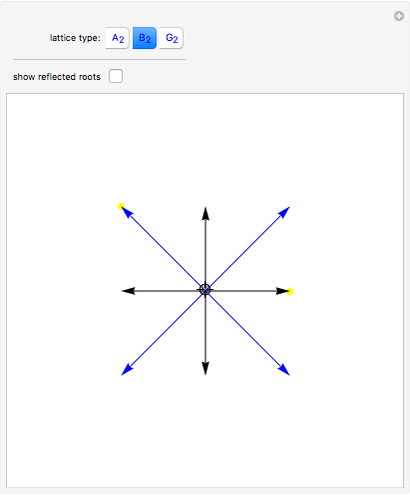 Click on "show reflected roots" and note that the root system is closed under reflections about the line perpendicular to a root. Every root of the root system could be written as an integral linear combination of simple roots. The number of simple roots is called the rank of the root system. Simple roots are marked with yellow dots. 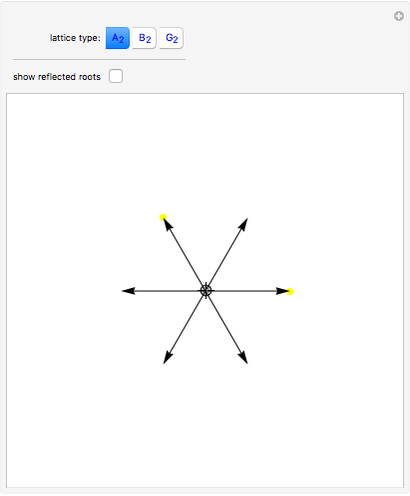 Reflections associated with simple roots generate finite groups. For roots systems relevant for this demonstration these are the Weyl groups , , of orders 6, 8, and 12, respectively. Oleksandr Pavlyk "2D Root Systems"